Algae are patchily distributed, from the smallest scale of the surface of an individual substrate, to an intermediate scale such as from stone to stone, through larger scales such as open versus canopied sections of streams. Although some herbivores might feed essentially at random, an ability to perceive and respond to this patchiness ought to be advantageous. Richards and Minshall (1988) studied grazer distribution at small scales in an alpine stream, using natural stones that were selected based on visual assessment of periphyton abundance and in some instances scraped to produce patches of various widths. Stones were replaced in the stream under glass viewing boxes, and insect presence was then determined by photography. Within 1-2 days, Baetis mayflies were concentrated in patches rich in periphyton. A similar response of grazers to periphyton can be seen at larger spatial scales. Fuller et al. (1986) shaded a 20 m long riffle with black plastic, reducing chlorophyll a levels after 4 weeks to <0.1 |g cm 2, compared to values from 1 to 6 |g cm 2 in unshaded sections. Simulium larvae increased slightly, and several taxa showed no apparent change, but Baetis was much rarer in the shaded section than in open controls. Removal of one half of the shaded plastic resulted in chlorophyll a levels similar to the open stream after only 11 days, as well as much greater Baetis densities. Body size was smaller for those mayflies that remained in the shaded section, indicative of reduced food availability, and also a rather surprising reluctance to depart for greener pastures. Unaffected taxa (Simulium, several crustaceans) presumably relied on other food sources. A similar experiment in a New Zealand stream (Towns 1981) failed to influence any of the fauna, and was taken as evidence that biofilms and associated microorganisms are the most important energy sources in some circumstances. At an even larger spatial scale, of stream sections or entire streams, grazing animals have been shown to respond to variation in resource availability. 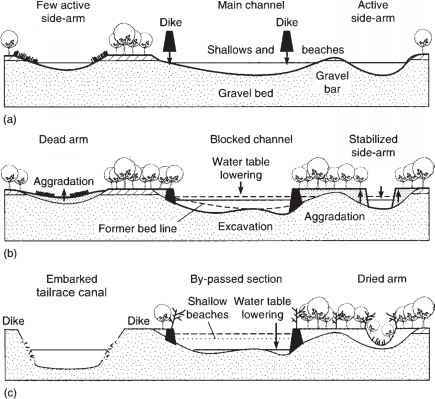 In a small stream draining an area that had recently been clearcut, Baetis production was roughly 18 times higher than at a reference site, and on stable substrates the difference was even greater (Wallace and Gurtz 1986). Mayfly guts contained mainly diatoms, and estimates of gut fullness from the open canopy stream were up to double those from the forested stream. Although algal cell densities varied little among sites, periphyton production (based on Baetis production and projected food consump tion) was estimated to be nearly 30 times greater at the open site. Subsequent forest regrowth resulted in canopy closure, and after 6 years Baetis was much rarer and periphyton production had dropped tenfold. Because clear-cutting affected the entire stream, recruitment rather than redistribution is the presumed mechanism. In fact, the response of Baetis was much greater than that of other mayflies, indicating that its short generation time allowed rapid increase in population size to take advantage of the newly available resources. Grazers can concentrate in food-rich locations through behavioral mechanisms at small and even relatively large scales, and such non-random foraging has been established in both vertebrate and invertebrate grazers of periphy-ton. In laboratory microcosms containing rocks with algae from a nearby stream, Baetis distributions were unselective when algal biomass was homogeneously distributed, but clustered on high-food rocks when it was heterogeneously distributed (Alvarez and Peckarsky 2005). Detailed analyses of foraging in the caddis larvae Dicosmoecus (Hart 1981) and the mayfly nymph Baetis (Kohler 1984) document that these insects spend much more time in periphyton-rich patches than would be expected under a model of random movement. When individual Dicosmoecus entered an area with abundant periphyton, gathering movements of the forelegs and the rate of mandibular scraping both increased. In addition, overall movement rate slowed, and individuals tended to turn back upon reaching a patch boundary. As a result, time spent in rich patches was 2-3 times what would be expected by chance alone. The ability to perceive spatial heterogeneity in food supply and respond by simple movement rules that tend to concentrate foraging in regions of high reward is termed area-restricted search. When the periphyton attached to an artificial substrate were scraped to create a checkerboard design that covered only 20% of the substrate surface, Baetis spent up to 80% of its time in food patches (Kohler 1984). By comparing the area searched to the smallest area that circumscribed the sequence of movements, Kohler determined that these mayflies searched food-rich patches very thoroughly. Moreover, search behavior upon departure from a patch was influenced by patch quality. 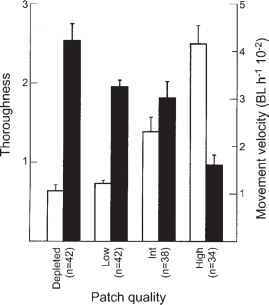 Search intensity was much greater just after departing a high quality patch, as evidenced by high thoroughness and low movement rates in comparison to movements following departure from patches of lower quality (Figure 91). ately with algal productivity, but for foraging gain per individual to be roughly constant. Power (1983) observed just this pattern in the distribution of armored catfish among pools in a Panamanian stream. Shaded pools were less productive and supported a lower abundance and biomass of herbivorous fish compared to open pools. However, individual growth rates were similar across this resource gradient (Figure 9.2). Movements of individuals among pools in a manner similar to the finer scale foraging behaviors of Baetis and Dicosmoecus presumably result in this pattern, referred to as the idealfree distribution. In sum, grazing animals respond to locations of high periphyton abundance, both by shifts in distribution and, if conditions persist, by population recruitment. These concentrations of grazers can either reduce or enhance variation in the distribution and abundance of periphyton, and as we shall see in the next section, influence the composition and physiognomic structure of the periphyton assemblage.